The Forsaken have been pushed to the wall by their enemies. Now they push back. The tribes share their deadliest secrets with one another. Their packs teach one another the secrets of striking first and hardest. Around the world, the Forsaken reclaim what is theirs. Will you join them? 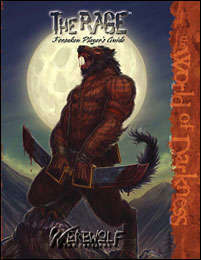 The Rage: Forsaken Player's Guide is a 220 page supplement for the World of Darkness game Werewolf: The Forsaken.